Apparently Griddle Cakes and Pancakes are the same thing, but I have always used Griddle Cake when describing a savory pancake. 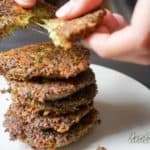 These Keto Griddle Cakes are super easy to make once you have the basics down. You can mix and match different ingredients to achieve any flavor combination you can think of. In this rendition we’re going to be reuniting 3 old friends. Bacon, cheddar cheese, and broccoli! Let’s get started. The bacon will be used in the griddle cake, but we will also be using the excess bacon grease to fry the cakes in. This is where ALL the flavor comes from! Render the bacon down in a nonstick pan until it is crispy. We don’t want it to be overly crispy, because it will still be cooking with the keto griddle cake for another few minutes and it may burn if you cook it too long initially. Once the bacon is rendered, set it aside to cool and leave the grease in the pan. Now add the cheddar cheese and pulse a few more times. Then add 1 large egg and…you guessed it…give it a few more pulses until everything is evenly mixed. Now add in the seasonings as well as the bacon from the previous step. Give the bacon a rough chop before adding it. Stir the mixture together with a fork. This is where we add the almond flour. The amount will vary based on how much liquid has made it’s way into your mixture. Pro Tip: Start with 2 tbsp of almond flour and add more if necessary. The mixture should be wet to the touch. It will barely stay together on it’s own. We formed the cakes on a spatula and used a fork to push them off the spatula and into the bacon greased pan. Once they cook on one side they will become solid and easy to maneuver. Cook them on each side for 3-4 minutes or until golden brown. These can be topped with sour cream, chives, or even some more melted cheddar cheese. They make a great side dish and can also be served as a main course atop a cauliflower puree. They WILL get soggy in the refrigerator. If you reheat them in the oven they will regain some of their crispiness, but they are much better if consumed on the day they are made. Enjoy these delicious Keto Griddle Cakes and let us know how they turn out for you! Render down 3 slices of bacon in a non stick pan. Set the cooked bacon aside and save the bacon grease for later use. Place 4 cups of broccoli in a food processor and pulse until it is uniformly chopped into small pieces. Add 6 tbsp of cheddar cheese to the chopped broccoli and pulse a few more times to mix. Add 1 large egg to the food processor and pulse a few more times until the broccoli/cheese/egg is uniformly mixed. Now add the seasonings as well as the roughly chopped bacon and stir lightly with a fork. The mixture will now be very loose. Add 2 tbsp of Almond Flour to bind the mix together. If more almond flour is needed, continue to add more. You are looking for a wet batter that can be formed into a patty by hand, but will feel as if it's going to fall apart. Thats ok! Place the formed keto griddle cakes into the pan with bacon grease over medium heat. Once the cakes cook for a minute they will be easier to maneuver and will not break apart. Cook for 3-4 minutes on each side, or until golden brown. Allow to cool for 3-5 minutes and enjoy!